When i recruited people to venture into greystokes provincial park, everyone always asked “where the heck is that?”. Weird, considering it’s only 60km from kelowna. It’s pretty much inaccessible without a truck, quad or snowmobile, but once there, there is some pretty cool stuff. 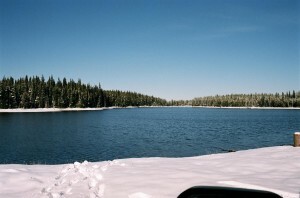 The main center of the park is greystokes lake, which is actually a reservoir. 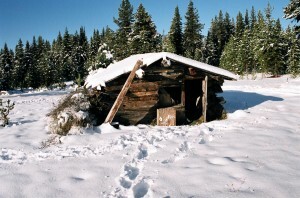 There are some snowmobile cabins you can stay in while exploring the lakes, hiking trails and backroads. There is also plenty of opportunity for free camping. When we were there, we planned on tenting, but ended up sleeping in the truck because we weren’t prepared for the winter camping that was at the top. it was 15 degrees in kelowna in october when we left. Also, the cabins were out because the 1st one was full of rowdy types, and the others were inaccessible do to the road not actually being passable, unless you have a rock crawler or other crazy 4×4. Maybe the road is slightly more passable without snow, but it would still take some skill. It’s a mission for next summer. Since there are so many extremely deactive roads, there are tons of opportunities for exploring on foot. But, a mountain bike would be the best i think. There are also some hiking opportunities in the park. a short trail just before greystokes lake leads to lemon lake. a small wooded alpine lake. There is also a longer (read multi-day) trip around some of the other lakes and to the summits of Jubilee Mountain and Mount Moore. Apparently the hilton cabin in the south of the park is quite nice. apparently. 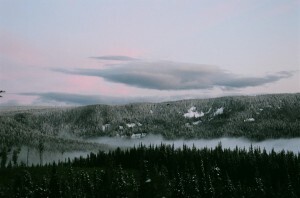 This park is a very popular snowmobile destination in the winter. very popular. partly because thats the only way to get around this largly unmaintained park. It turns out that this park is pretty darn cool. unfortunately, besides the one or two hiking trails (though they do seem epic) there is not too much in the way of maintained, non-motorized stuff to do. If you are down with random back-country hiking and snowshoeing, self guided old road mountain biking, then this is a sweet place. But be prepared, though it is not so far from kelowna (access greystokes FSR off highway 33) it can be a lonely place to have a truck breakdown. There is no cell reception either. Thanks for posting the Graystokes info Rex. I (TracksAndTrails webmaster) figured you wouldn’t mind if I posted the Graystokes pics that I had as well. I even give you a few shots of a couple of the cabins up there. You have some very nice photos of the park and true information here! I have some more photo’s and will post them ASAP and link to this post. Hey Darkest1, I put up more Graystokes pictures that I had and the GPS track that you sent to me. it’s cool to see what it looks like without snow. i can’t wait to see it 1st hand nest spring/summer. thanks for adding your stuff. Hey John, thanks for dropping by Tracks And Trails. I lived out in New Brunswick for 7 years. 3 years St. John / St. Stephen and 4 years in Moncton! While I enjoyed camping there, what I missed most was the accessibility to crown land and freedom to camp almost anywhere! In Southern NB it just seemed all the land is private and there were too many fences! Unfortunately I never had the chance to hike around the northern area. I would love to explore along the St. Lawrence more! Do you know if the cabins can be used in the summertime?